We have only had our RV SunSeeker for a short time so have been going to RV Parks within a few hours of our home to get use to our new purchase and check out campgrounds that we may want to come back. This campsite was a fun time. 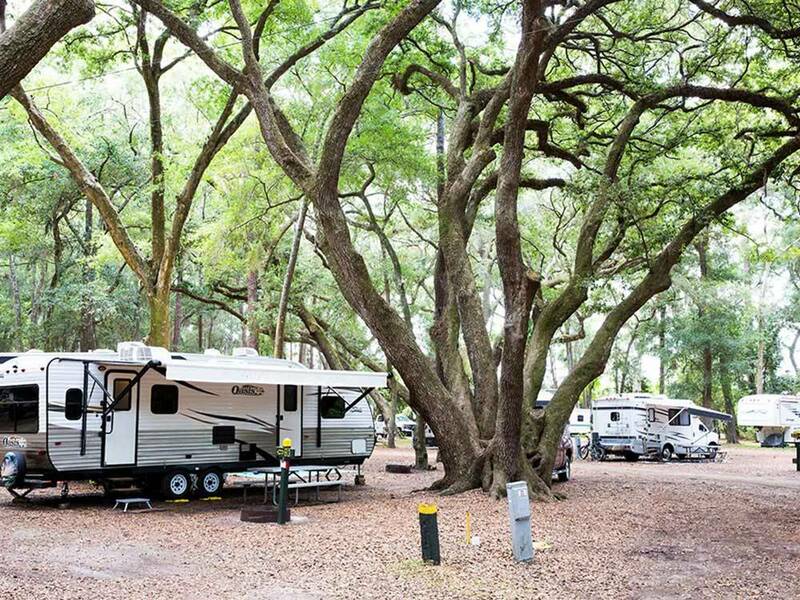 There are many trees everywhere and we had a back in site which was just a little challenging for these new RVers at 31 ft. The campers around our site were all sitting out enjoying the cool weather and campfires and I think enjoyed our efforts and one camper had even lended a hand in helping miss a few trees. Once settled, we hooked up everything, leveled our camper but site was pretty level already and got set up. Picnic tables are supplies and we added our rug outside. We have little dogs so we got them hooked up outside and they explored our area. Lots of bags and disposal around the park for the dogs. Dog park as well. There are lots of trees on all the sites so it helps with privacy. Cable and internet as well and we had full hook-ups. I think for two days total around $90.00. Very clean park and the hosts are very friendly and helpful. We had campsite H1 which seemed to have a lot of 3 month renters from up north that have been coming for 10+ years which says a lot for the park. All were very neat with their sites. We were close to the Restrooms. There is a $10 charge getting on the island. We didn't go off so we just paid it once but you can buy a pass or pay each time you leave and come back. The park has a nice golf course, very old hotel where Rockefellers stayed in the days which has a huge wonderful Sunday brunch with fresh seafood galore and so much more. A little pricey I think $35 a person but some a wonderful experience. I highly recommend this RV Park. We will be back! 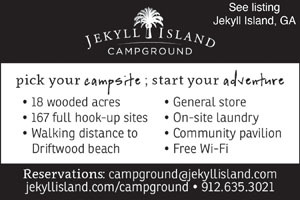 We really enjoyed our stay on Jekyll Island. The gal who checked us in when we arrived was not very friendly...no warm welcome She gave us the paperwork and not concerned if we knew our way around. Given this was our first visit I was not impressed. The other gal was smiling and appeared friendly. Neighbours stopped by to say hello and many had holiday decorations up. We will definitely stay here again when we are passing by.